I drive past this building twice a day. For ages it's been the run down Sportsman's Arms: unloved and unoccupied. Then someone appeared to be renovating the building. It had a lick of paint, next a bit of building work, and last of all a spanking new sign. 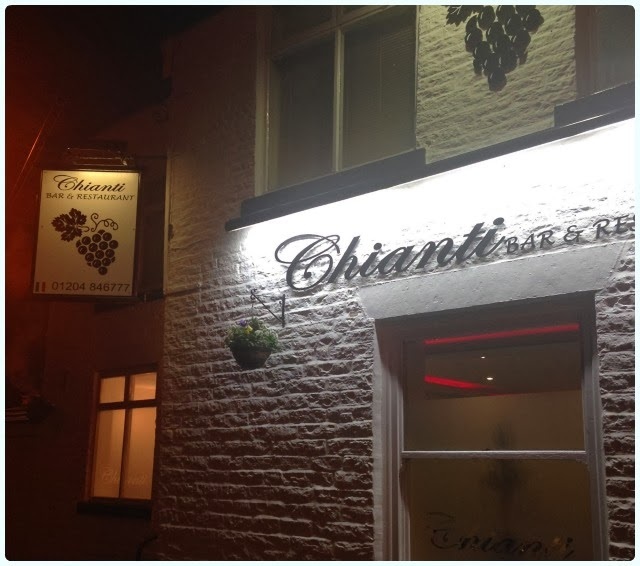 Chianti has been open for a couple of weeks now, so we popped in to see what was going down. Let's face it. Bolton's dining scene isn't exactly vibrant, is it? Horwich is pretty decent these days, with long standing Italian hero Il Toro flying the flag for decent local food. Bolton is another story. It's all about Maccy D's and more recently, yet another Subway. Can you see why I fail to get excited by such a poor show? Even the nicer establishments like Nam Ploy and Nick's fail to have the same buzz they had years ago. However, things are a changing. Times are tough, and talented chefs need somewhere to call home, earn a decent crust and not be robbed blind by extortionate rents in the process. Jon Jones of The Farmer's Arms is doing wonderful things up in Darcy Lever, and Shebs and the team at Bengal Cottage in Horwich have enjoyed so much success in their first year, that they have just opened a second restaurant in Adlington. I knew Chianti would go one of two ways with no middle ground. Luckily our gamble paid off. We arrived on a gloomy Friday night, a little damp form the murk outside. We were welcomed by two young ladies with beaming smiles. The restaurant was already quite busy, but they found us a nice table by the window and left us to peruse the menu. Inside is clean and bright, and tables are well spaced. 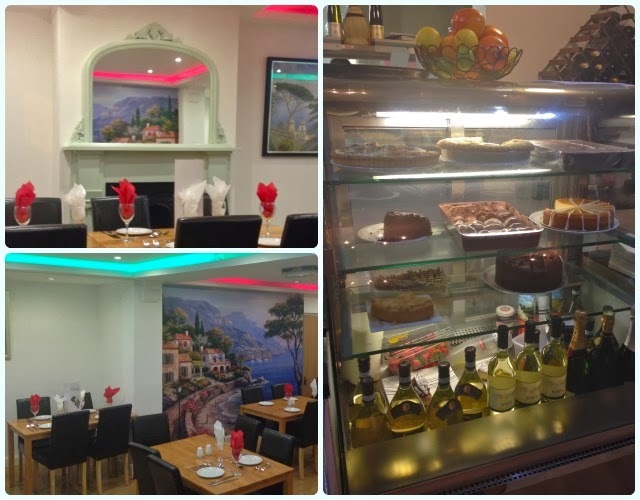 It feels like a traditional family run type of place, complete with the charming Italian waiters you would expect. 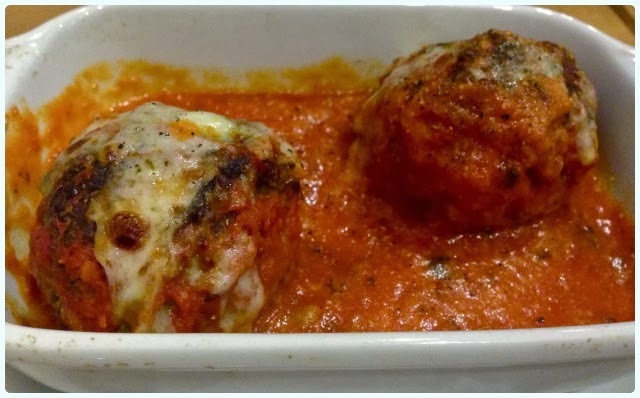 The menu is very reasonably priced too, and whilst they are not some of the most attractive dishes I have ever seen, they are extremely good value. 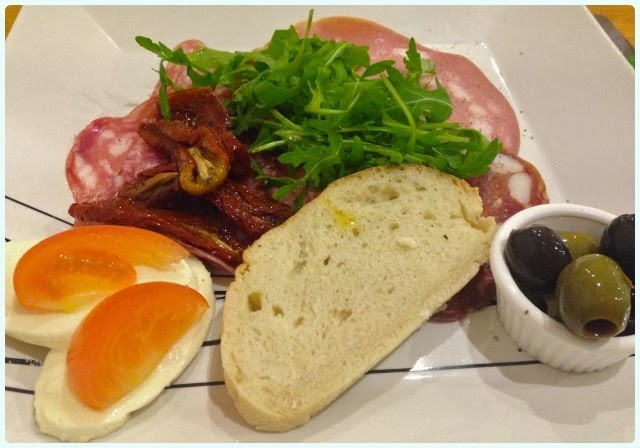 Antipasto Misto Platter: This is a selection of cured meats, olives, sun-dried tomatoes, Mozzarella, bread and salad. Basic, but it did the trick. There's quite a lot here for one person, but it would be ideal to share. 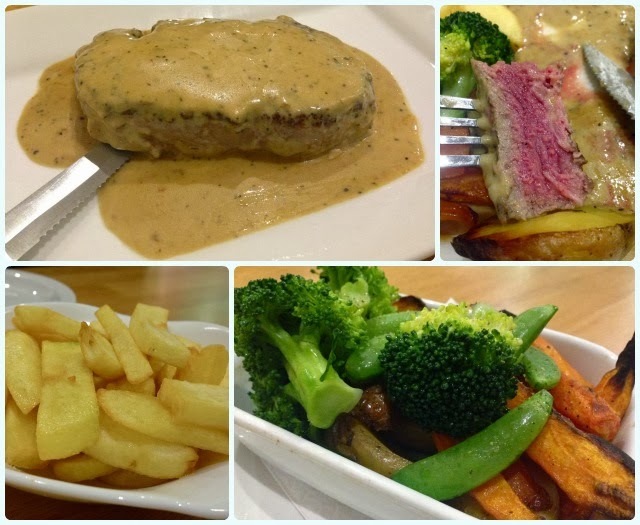 Bistecca alla pepe: Sirloin steak in a peppercorn sauce. It's my favourite... Italians just have a way of doing this simple dish really well. This was everything I had hoped. A thick, juicy steak cooked just as I requested. This was outstanding value at just £13.95. It came with a lovely side dish of steamed and oven roasted vegetables, and we ordered a side of chips too. 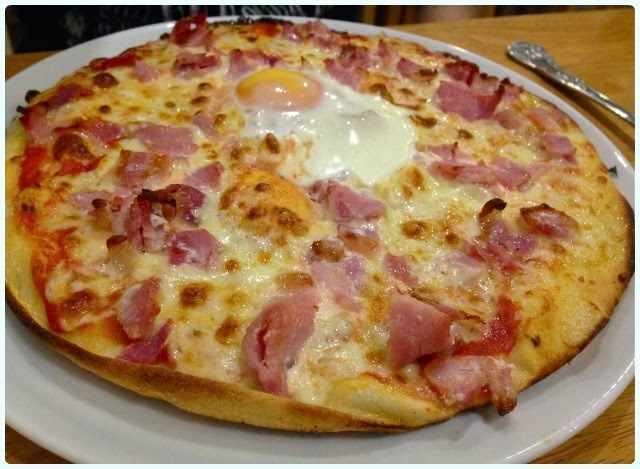 Pizza Chianti: The house special with Mozzerella, egg, bacon and mushrooms (sans mushrooms in this case!). The dough smelled of freshly baked bread, the edges were perfectly crisp and the bacon was the proper stuff, not reformed ham. This huge pizza was just £5.95. Bargainous. 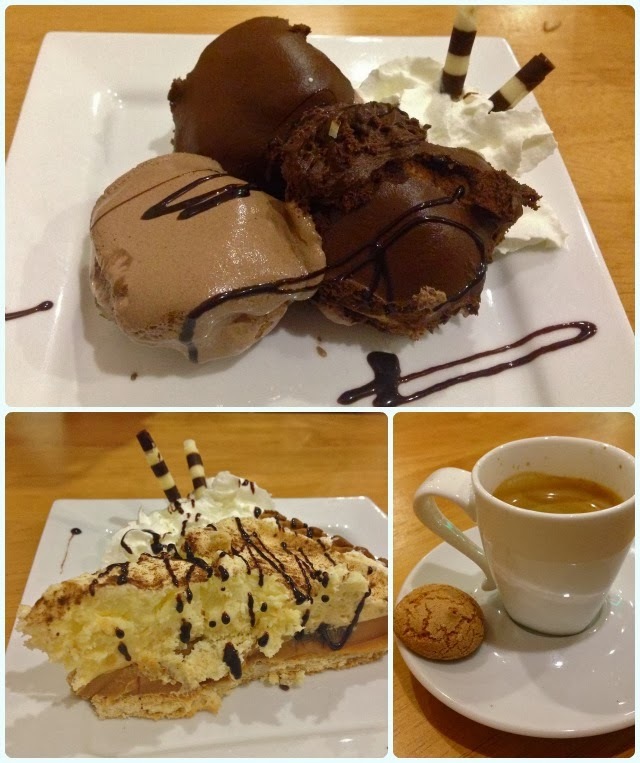 Desserts - Profiteroles and Banoffee Pie: Chianti have an old school style desserts chiller where you can go and look at the options before you make a choice. I like this! How many times do you order something and it wasn't what you imagined? I couldn't resist having the profiteroles, which were actually large choux buns pumped with fresh cream. Yes they came with squirty cream. Run with it. My husband had the banoffee pie, which was a towering piece of pud with a mountain of fresh cream on top - and yes, it had the quintessential squirt of cream with two cigarillos peeping out of the top! We'll definitely be returning to Chianti. I would have been happy to pay considerably more for this food, but hopefully their low prices will attract herds of new customers and word will spread. We paid just over £55 for drinks, two starters, mains and desserts - that's exceptional value for food of that standard. My only criticism is the presentation, but it doesn't matter when the food tastes great. Here's hoping that this is the start of a new burst of culinary energy for the town. Let's show them there's more to our borough than famous fast food joints and pound shops. This is my sort of restaurant. The menu looks excellent! If I am in Bolton area I will look for it. I love the look of that steak and the dessert looks fab! I am inviting over to my blog for a new challenge "Let's Party!". You are very welcome to enter a recipe if you like!